Avoid peak Summer season in order to avoid the worst of the crowds. We are comparing Heidelberg and Rhine Valley Day Trip from Frankfurt Prices from leading ticket suppliers and Try to find you Cheap tickets prices on the market. Heidelberg is located in the Baden-Württemberg region approximately 50km South of Frankfurt. A beautiful medieval city situated on the River Neckar, it boasts superb views of the lush green valley and is said to be one of Germany's most beautiful cities. The city is famous for having the oldest university in Germany and medieval castle ruins that contain what is said to be the world's largest wine barrel. The old town has picturesque narrow cobbled streets that still retain historic half-timbered buildings. The Rhine Valley is a UNESCO world heritage listed site with picturesque villages, medieval towns and historic castles. The River Rhine runs through the valley stretching a total of 1,232 km or 766 miles, starting in Switzerland and finally ending at the North Sea. A great way to see 2 of Southern Germany’s most picturesque locations - Perfect for travelers who are short on time. If you love culture, medieval history, architecture, and stunning landscape scenes you will love this trip! Due to the length of time traveling by coach the tour is not suitable for those who suffer from motion sickness and is not ideally suited to families with young children due to the long day. Your Experience With Heidelberg and Rhine Valley Day Trip from Frankfurt? Leaving Frankfurt from a central location at 9.30am onboard a modern air-conditioned coach you will travel 80km (50 miles) to Heidelberg. Said to be Germany's most beautiful city, you'll get to see all of its historic charm for yourself. Enjoy a tour around the ruins of Heidelberg Castle as you marvel at the city views below and the landscape views surrounding the castle. Be sure to stop and see the famous wine barrel, said to the largest in the world. 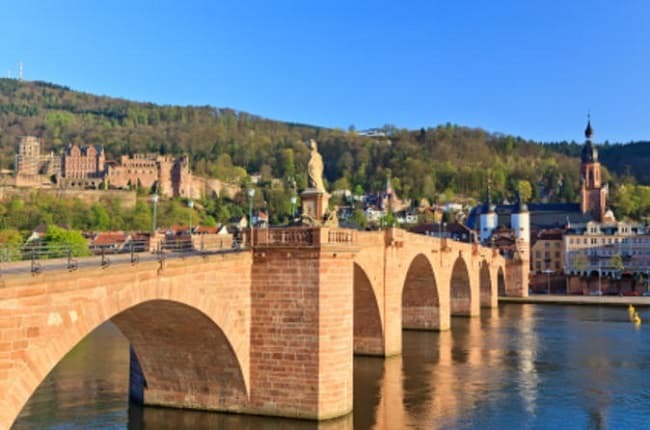 Your guide will then take you to see the old town to see the most important sites including the Karl Theodor Bridge, the Church of the Holy Spirit, Heidelberg University, and more. You will then get back on the coach and travel to the Rhine Valley, passing picturesque villages, medieval castles, and vineyards on the journey. At Kaub you will disembark the coach and board the steamer boat for a relaxing cruise down the beautiful River Rhine heading towards the medieval town of Rudesheim. After the boat trip you will have a wine-tasting session followed by dinner in a riverside tavern before making the return journey to Frankfurt. What Heidelberg and Rhine Valley Day Trip from Frankfurt Includes? Guided walking tour of Heidelberg Old Town. Dinner in a riverside tavern. Return transfer by coach from Frankfurt. If German or English are not your first language and you struggle to understand the live guide you can request an audio guide for a small fee. The dinner options are limited to a chicken dish or a vegetarian dish - If you want something different such as schnitzel you have to pay extra. You also have to pay for drinks and dessert. Travelers Reviews about Heidelberg and Rhine Valley Day Trip from Frankfurt? Travellers talking about this tour on Viator and Tripadvisor are, for the most part, thrilled with their day trip leaving ratings with 4/5 and 5/5 stars. Comments include "This was one of my fav tours", "A very enjoyable tour", "A lot of fun", "Our guide was excellent", and "Would do it again". Travellers agree that the Rhine Valley scenery is amazing with the castle in Heidelberg and the Rhine Valley boat trip being the highlights of the day. People have mixed views about the quality of the meal, some loved it, some hated it, but generally everyone agrees that the wine tasting part of the trip is poor. However, everyone agrees that the guide is great fun, really helpful and informative without making the information boring. The trip comes highly recommended by most people, many with many happy to take this tour again in the future. Make the coach journey comfortable by packing drinks and a snack, perhaps a travel pillow too. Meet in Central Frankfurt at Greenline Tours office.